This light photomicrograph shows a cross section of human tissue, with black pigment particles of a tattoo located in the light pink dermal layer; viewed at ‘‰ˆ 1,000x. See Microscopy and Microanalysis of Tattoo Inks on page 147. 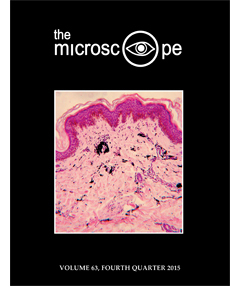 Excerpt: This issue of The Microscope features an article on the microscopy of tattoo ink identification by Michelle D. Miranda, a forensic scientist who holds a Ph.D. in criminal justice from the Graduate Center of the City University of New York (see ‘Microscopy and Microanalysis of Tattoo Inks’ on page 147). Miranda presented her research on tattoo inks and pigments at the Inter/Micro 2015 conference in Chicago and followed up her talk with this in-depth article. There are a number of reasons why we might want to identify the materials used by tattoo artists. As Miranda explains, the study of tattoo ink pigments can aid in the identification of human remains or help further anthropological and archaeological studies of culture and history. On a broader scale, forensic trace evidence examiners, art conservators and analytical chemists may regularly work with paints, dyes and inks, simply because they are prominent in crime- or accident-scene investigations, art authentication and materials analysis. Abstract: In forensic science, the recognition of inorganic and organic pigments in human tissue can aid in the identification of charred, decomposed, mummified or otherwise unidentifiable human remains. In the fields of art conservation and cultural heritage, the characterization and archiving of organic pigments found in traditional tattoo inks can aid in future anthropological and archaeological studies of human culture and history. This research explores the application of microscopical and spectroscopical methods employed in the analysis of modern organic pigments found in tattoo inks. The aim of this research was to scientifically evaluate these inks by documenting their physical and optical properties with macroscopical and microscopical methods and identify the chemical properties of the pigments through spectroscopical analysis. Analytical methods included Fourier transform-infrared spectroscopy (FT-IR), Raman spectroscopy, surface-enhanced Raman scattering (SERS), ultraviolet/visible spectrophotometry (UV/Vis) and X-ray fluorescence (XRF). The lack of an established method for analyzing tattoo inks and a comprehensive database for comparing them were additional catalysts for this research..
Abstract: The need for precise identification of the fibrous/acicular zeolite mineral erionite has become increasingly important due to erionite’s ties to mesothelioma in Turkey and to lung disease in western North America (1). The regulatory community struggles to unambiguously identify asbestiform minerals when they occur in natural rather than built environments. Zeolites present an even more unique set of problems due to the similar cation content and crystal structure observed between different zeolite species such as erionite and offretite. Currently, there is a lack of regulatory methods for accurately identifying erionite particles in nature. We tested a variety of techniques that can be applied for the identification of erionite, including the use of selected area electron diffraction (SAED) with transmission electron microscopy (TEM), indirect zeolite identification with polarized light microscopy (PLM), and powder X-ray diffraction (XRD) for analysis of bulk composition. We found that smaller TEM-scale data provides paramount structural information in the form of diffraction patterns because erionite shows systematic absences (i.e., diffraction constraints) along uv0 of 00l = 2n due to its space group symmetry, while the other zeolites in this study will show different diffraction constraints along c*, and different repeats in c (2). We have shown that by using a combination of scale-dependent identification methods, such as TEM, PLM and XRD, these zeolites can be accurately distinguished from one another with sufficient care. This is the second part of a two-part article. The first part was published in Vol. 63, No. 3. Abstract: In 1767, the Duc de Chaulnes determined the refractive index (RI) n of a glass plate with a compound microscope from the equation, Refractive Index ‘‰ˆ Real Thickness/Apparent Thickness. This method was adapted by Sorby in 1877 to determine the principal RIs of mineral plates. For thin sections the method was hampered by the difficulty of identifying a section’s underside with transmitted light, but this surface can be identified easily with incident darkfield illumination. Another complicating factor, the effect of permanent coverslips can be avoided with uncovered polished thin sections. Transmitted circularly polarized and circularly analyzed light expedites the selection of suitably oriented anisotropic crystals, and guided by their interference figures, these crystals can be rotated into the orientations needed to measure principal RIs. The ω RI of uniaxial crystals can be determined from crystals in any random orientation, while the ε, α, Î² and γ indices can be determined with a narrow slit, the long axis of which is oriented perpendicular to the analyzer’s privileged direction. Accuracy is attained by calibration with a RI standard and by accurate measurements of axial translations of the microscope stage relative to the microscope tube. 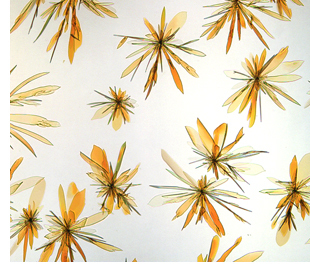 Photomicrograph in the Inter/Micro 2015 Photomicrography Competition.